Take note of any unusual, throaty sounds your cat makes. If you're being subjected to a cacophony of hacking, gagging, retching and coughing sounds coming from your poor cat, don't just assume it's the upcoming emergence of a hairball. Excessive heaving sounds can point to a variety of potentially harmful medication conditions in your wee one, including asthma. If your cat is persistently gagging because a hairball is coming up in her throat, the thing in question is sure to quickly pop out -- probably right onto your couch or carpet, yikes. The whole process typically takes several minutes at a time, although it varies. When your cat coughs out a tube-shaped, wet and hairy clump, then you have your answer. These unsightly clumps are typically surrounded by bile and other stomach fluids. The unwelcome appearance of a yucky hairball isn't the only clue to your fluff ball's situation. Be on the lookout for other key symptoms of hairballs, including stomachache, stomach upset and throwing up. If your cat fails to produce a hairball after excessive -- and uncomfortable-looking -- sessions of extended gagging and hacking, don't just assume that another condition is causing his behavior. Your little one may be suffering from intestinal obstruction, a rare but dangerous effect of hairballs. Monitor your precious pet closely for any unusual and possibly dangerous hairball signs, including reduced appetite, exhausted behavior, constipation, tangled fur and depressive mood. If you notice any of these things, seek emergency veterinary attention for your pet immediately -- hairball blockage often calls for surgical treatment. Excessive coughing and gagging can point to a variety of health ailments that are entirely unrelated to hairballs. Because of this possibility, take your pet in for a veterinary examination once you notice the uncharacteristic gagging behavior. Some medical disorders that often produce gagging and coughing symptoms are asthma, allergies, feline heartworm disease and upper respiratory infection. Remember, your cat's health and happiness are worth your time and your efforts. 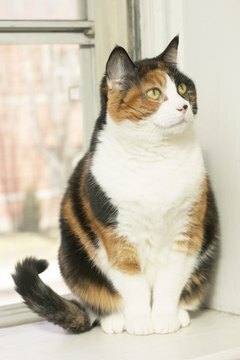 For yet another clue as to what is going on with your cat's gagging sounds, take a quick look at her coat. Long-haired breeds like Persian and Himalayan cats are more susceptible to hairballs, and understandably so. The pesky masses are caused by accidental ingestion of fur. The more hair your pet has, the more that can end up in her mouth. Do Cats Make Noise before Hairballs?